Mouth burning hot peppers (Capsicum annuum) come in all sizes and colors and they are available throughout the year. This eye watering fruits (technically) are low in calories and full of health benefits. Besides adding zest to flavorful dishes, hot peppers are loaded with good nutrition. If you are not a fan of spicy food you should know that hot peppers as an excellent source of vitamins A and C, potassium, folic acid, fiber and especially compounds called capsaicinoids are a good choice for a healthy diet. This key ingredient known as capsaicin is responsible for the spicy flavor in hot peppers and for most of the health benefits that hot peppers can offer. Hot peppers with their anti-inflammatory, analgesic and anticancer properties are going to help you with: arthritis, psoriasis, high blood pressure, cholesterol, digestion, triglyceride levels, prostate cancer prevention, stomach ulcer prevention, stamina, weight management, headaches, diabetes and heart attack prevention. Contrary to popular belief seeds are the spiciest part of peppers. The hottest part of peppers is the point where the seed is attached to the rib or interior vein. The seeds set your tongue on fire because they are in close contact with the hot ribs. The hot pepper ribs have sixteen times more capsaicin then the rest of it. Since capsaicin, which makes hot peppers “hot”, is an oil, drinking a glass of ice water right after having a hot pepper will not cool down the heat in your mouth, but it will only exacerbate the effects instead. The best way to neutralize the heat in your mouth caused by hot peppers is casein, protein commonly found in milk. Capsaicin likely exists as a defence mechanism against harmful fungi and microbes that can enter through holes on the hot pepper skin made by insects. Hot peppers may irritate the flesh of mammals or stop fungi, but birds are completely immune to its effects and can spread its seeds successfully. Capsaicin is an active component of hot peppers that makes peppers spicy hot and gives them their powerful kick. Studies have shown that capsaicin has the potential to modulate metabolism for about eight percent over a person’s normal rate by positively affecting proteins that help break down fat. Hot peppers have been used to improve blood circulation for centuries, and there is no other vegetable, fruit or herb which can increase your blood circulation faster. When you eat one, the capsaicin stimulates your nerves and increases your blood circulation immediately within seconds. Hot peppers don’t cause ulcers, on the contrary, numerous studies have been shown that eating hot peppers can help with digestion by increasing the digestive fluids and by fighting bacteria H. pylori, the most common cause of ulcers. Eating hot peppers may also help fight bacterial infections that can cause the more serious cases of diarrhea. 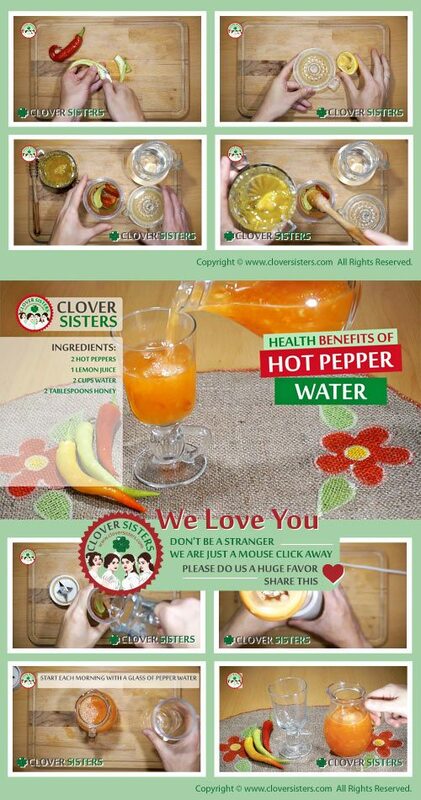 Hot pepper water is a brilliant and simple addition to your health and wellness routine. It is easy to make and it is going to detox your body naturally. Put the ingredients into the blender and blend it. Start each morning with a glass of hot pepper water.